In our Charles Schwab review, we will take a look at what makes this brokerage firm one of the largest in America, and a place that people have trusted their retirement accounts as well as investment accounts for several decades, as it was opened in 1971. By using Charles Schwab, you will enjoy many benefits and the stability of a well-founded brokerage firm. Beyond that, Charles Schwab offers robo advisors, something that is starting to catch on around the financial world. In a world of algorithmic trading, this can be very strong as well. Charles Schwab has been a leader in technology and is known for its great analysis by people such as Liz Ann Sonders, a regular contributor to CNBC. As one of the titans of Wall Street, your account is heavily regulated and protected. 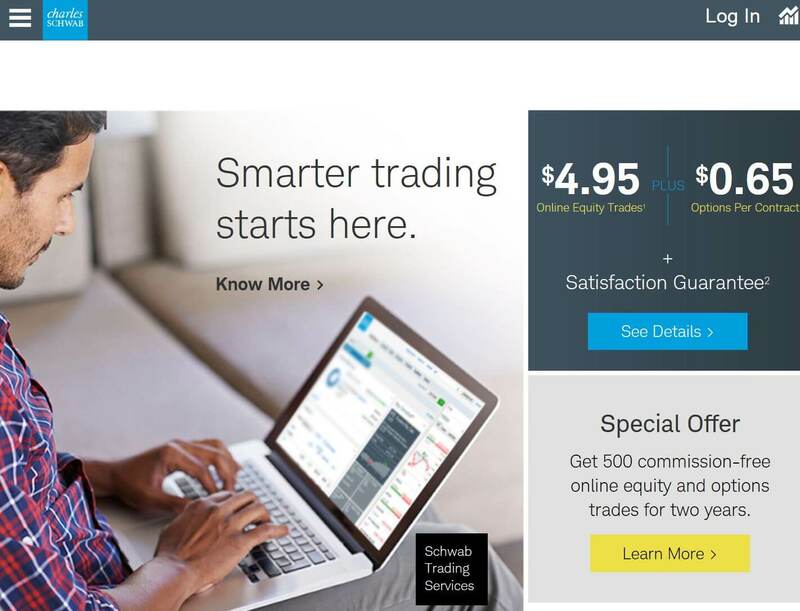 As far as trading platforms are concerned, your Charles Schwab account has you covered. There is Web Trading, which is an online trading platform that is streamlined in order to place trades and the like. You have all of your basic needs fulfilled through this platform and is a great place to monitor your positions. The Web Trading platform will be where most investors will feel the most comfortable as it is highly intuitive and not overly complicated. Charting options are numerous, and of course the ability to monitor news, balances, and a watch list are all available. The mobile application allows you to trade and monitor your positions on the iPhone, Apple Watch, tablets, and many other devices. This allows you to have a pulse on the markets, while on the go. The mobile application is stored on the cloud, keeping your layouts, and preferences on demand. The mobile app gives you the ability to trade, but in all honesty it is probably better to use it for monitoring your positions more than anything else. As a general rule, these platforms aren’t where people get into the market, it’s where they watch their positions that are already live, and then either take profits or exit a losing position. This is especially true with the Apple Watch, as the screen is so small. However, the flexibility to keep an eye on your account on the go is a huge advantage. Charles Schwab has many of the investment products that you would expect, such as mutual funds, exchange traded funds, money market funds, stocks, international stocks from over 35 countries, bonds and fixed income products, options, futures, margin loans, annuities, and will even sell you insurance to protect all of your financial needs. Because of this, the people Charles Schwab can take care of your entire financial suite of products necessary, giving you the opportunity to have a “one-stop shop” of financial products. Unlike many brokerage firms, Charles Schwab is able to provide multiple products due to the sheer size and magnitude of the brokerage firm. This is due to the longevity of the firm, and of course the sheer economic power of Charles Schwab. Offering so many products, Charles Schwab has a long list of varying pricing when it comes to trading. For example, if you are going to trade stocks or ETFs, for an online trade it is $4.95 per side. However, if you are buying mutual funds, your online trade cost will be $0. Options are a very fair $4.95 plus $0.65 per contract. What’s truly interesting is that futures and futures options both trade at $1.50 per contract, per side. That’s a very competitive price. Fixed income is $0 for treasuries, REITs are $4.95 per side, and other bond such as municipal and zero-coupon treasuries have a minimum of $10, with a base of $1 per bond. Obviously, if you are calling in to have a broker place a trade the fees due go up, but what I find particularly nice about Charles Schwab is that they have almost no other fees for opening accounts, transferring money, and the like. There is a $25 fee to wire money from your Schwab investment account, but I find that fair as it is the cost of sending money through the Federal Reserve wire system. Your Charles Schwab account comes with a ton of free education. They offer an entire section called “insights”, that go through retirement planning and education, savings basics, how to invest, opportunities to save for retirement and how to go about it. Estate planning, and a tax center. Beyond that, there are podcasts that the analyst put up, as well as analysis of various markets that Charles Schwab offers. Market commentary, personal finance, and international stocks are all covered in the “insights and ideas” area. This is a huge section on the site that is well thought out, planned, and clear in its sections that cover all of your needs. The education section goes all the way from beginner to advanced, so therefore each one of you will be able to find the appropriate education for your level of financial acumen. Customer service is a huge advantage to trading at Charles Schwab. There are a plethora of phone numbers that you can call, depending on what account you are using. There is a hotline for each of the brokerage accounts that you can call, as well as the ability to chat online 24/7. Beyond that, you can also visit a branch near you, as there are hundreds of them throughout the United States. The ability to contact Charles Schwab around the clock and every day of the week is a major advantage that you don’t necessarily find it other brokerages. Charles Schwab has been one of the largest players on Wall Street since 1971. The sheer strength and pedigree of the brokerage firm allows you to trust it, as it is highly regulated and has decades of performance for their clients. The lack of fees is a huge bonus as well, as unfortunately far too many brokerage firms make their money from nickel and diming their clients. The ability to trade international stocks, futures, options, and a whole host of other financial products of course is a huge bonus as well. Like TD Ameritrade and E-Trade, Charles Schwab is an excellent retail brokerage for long term investing. However, as the TD Ameritrade review reveals, TD Ameritrade is the better choice for active high volume day trading enthusiasts. The platforms are intuitive and the professional platform, StreetSmartEdge, has a whole host of technical indicators to choose from, regardless of your trading style. Ultimately, this is one of the better brokerage firms that you can find in the United States. Beyond that, you have the ability to not only trade financial products, but plan for your retirement and take advantage of other financial products such as insurance. Charles Schwab even has a bank for those of you that would like to have a checking account attached to your investments.